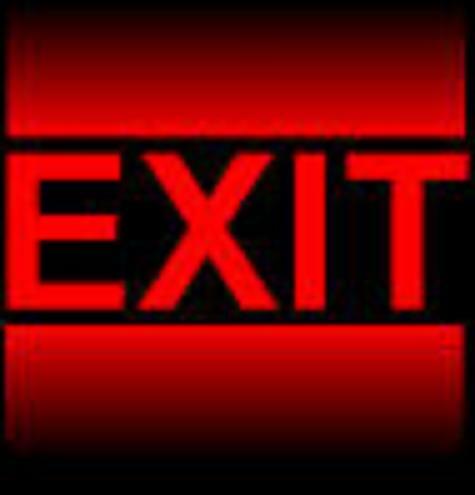 The Crisis of the Early 21st Century: A Critical Review of Alternative Interpretations | Baierle & Co.
That capitalism underwent a new structural crisis about three decades after the crisis of the 1970s, and under circumstances evocative of the Great Depression, raised numerous interrogations. Within the radical Left, the crisis arose the hope of a major transformation, still to come as of 2011. The purpose of the present paper is to discuss the set of interpretations of the crisis put forward by Marxist economists. We recall that, in the mid-1990s, we defined neoliberalism as a class phenomenon. More specifically, neoliberalism is a new “social order”, which followed the class compromise of the postwar years, in which capitalist classes restored their powers and income, con- siderably diminished during the first decades following World War II: a new “financial hegemony”. We denote as “Finance” the upper fractions of capitalist classes and their financial institutions. (Finance, directly or indirectly, owns the entire large economy, not only financial corporations.) Two other features must be added to this broad characterization. First, the control of financial institutions— now supposed to work to the strict benefit of capitalist classes — was a prominent component of the new social order. Second, the tran- sition, under capitalist leadership, to this new power configuration would have been impossible if it had not been conducted in alliance with managerial classes, notably their upper segments. The overall interpretation we gave of the current crisis, as a “crisis of neoliberalism”, is summarized in diagram 1. (Some of the empirical observations involved in this analysis are shown in the figures in the following sections.) At the root of the entire process is “neoliberalism under U.S. hegemony”. From this, derived two strands of explanatory factors. 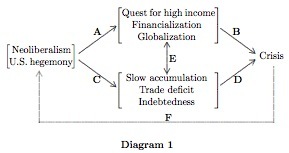 In the upper part of the diagram are mecha- nisms typical of neoliberal capitalism in every country: (1) the quest for high income; (2) financialization; and (3) globalization. Capitalist classes always seek maximum income, but after the imposition of neoliberalism in the early 1980s, major transformations of social relations were realized in comparison to the previous decades, aim- ing at this maximization. A new discipline was imposed on workers and all segments of management; new policies were defined to the same end; free trade placed all workers of the world in a situation of competition; capitals were now free to move around the globe seek- ing maximum profitability. To financialization and globalization, one can add deregulation that conditioned both processes. Financializa- tion and globalization converged in financial globalization. There is, therefore, significant overlap in the definition of the three aspects listed in the diagram. Because of the leadership of Finance in the conduct of the neoliberal endeavor, we denote the crisis as a “crisis of financial hegemony”. The practices that led to the crisis echo Marx’s analysis in the Com- munist Manifesto of capitalist classes acting as apprentice sorcerers, a characterization that nicely matches the features of the contemporary crisis. The crisis could have come later to the world as a result of this neoliberal strategy pushed to the extreme, but it came from the United States during the first decade of the 21st century. On the one hand, the country was the most advanced among the large capitalist countries in the conduct of the above transformations. On the other hand, as depicted in the lower frame of the diagram, a set of other “specifically U.S.” features converged with the above mechanisms. They can be described as the trajectory of disequilibria of the U.S. economy, in both its national and international aspects. 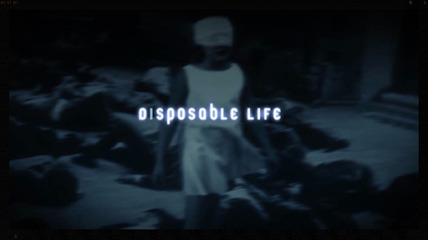 The main components of this trajectory are as follows: (1) the declining rate of capital accumulation; (2) the rising share of consumption (including housing) in GDP; (3) the rising indebtedness of households; (4) the widening deficit of foreign trade; (5) the increasing financing of the U.S. economy by the rest of the world (“external debt” for short). The two later trends would have been impossible to maintain during 30 years in the absence of the international hegemony of the country, of which the position of the dollar as world currency is a consequence and instrument. 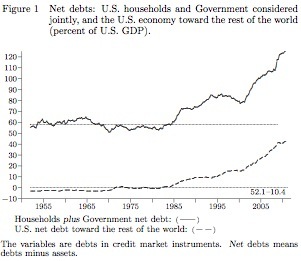 The growth of the domestic debt (the debt of households prior to the crisis), the expression of the policy intending to support domestic demand, was only made possible at the cost of the tolerance toward laxer lending practices and the corresponding wealth of daring financial innovations, which, finally, manifested themselves in the mortgage wave (given the sales to the rest of the world of the securities issued to support lending). As is well known, it is the collapse of this mortgage pyramid that destabilized the overall fragile financial structure and, finally, the real economy. But the pyramid was already there, the expression of unsustainable real and financial trends. Financialization has been a basic feature of capitalism from its origins, with a dramatic acceleration within neoliberalism, but the an- alysts of the crisis should not overlook the explosion of financial mech- anisms after 2000, which supports the thesis of a major role. In all instances—securitization, Collateralized Debt Obligations (CDSs), Credit Default Swaps (CDSs), conduits, commercial paper, leveraged buyouts, currency exchanges, derivative markets, and the like—the same accelerating process is observed after 2000 to the outburst of the crisis. 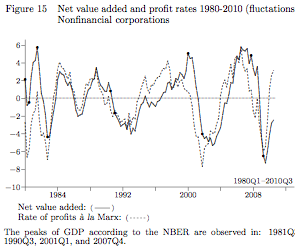 As evident in figure 5, all measures of profit rates undergo significant fluctuations. 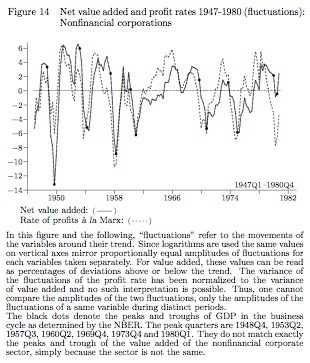 In the after-tax measure ( ), a rather large fluctuation is observed prior and during the recession of 2001 and a new one, of much smaller amplitude, prior and during the recession in the current crisis. (The NBER locates the recession between the fourth quarter of 2007 and the second quarter of 2009). Returning to Figures 14 and 15, one can observe that there is nothing exceptional in the fluctuation of profit rates associated with the latter recession. 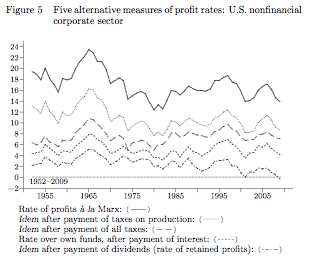 The amplitude of the peak in the profit rate is “standard”, and the trough in profits less deep than is often observed. The hypothesis that these fluctuations caused a major recession appears very questionable. As in the case of most other recessions if not all, the contraction of output began with the decline of residential investment. As shown in Figure 16, the initial steps upward of delinquencies and charge-offs were observed in the first months of 2006. The figure also emphasizes the specific pattern observed during this recession. While during the 1990/1 and the 2001 recessions the rise of commercial and industrial deliquency rates was much larger than in the case of residential mort- gages, the opposite is true of the 2008 recession. It is unquestionably this mortgage shock that destabilized the macroeconomy and caused the credit crunch, not a prior decline in the profit rate. Read full article at author’s page. An updated version is also available at author’s page.